Wendy Percey of Lesley Shand Funeral Directors, centre, and Garry Dickerson of Seyward Window Ltd, blue top, and Cllr Paul Harrison representing the Corfe Mullen Parish Council with the winners of the Corfe Mullen 5K and children’s one mile run. More than 300 runners took part in this year’s 5k and one mile races following the 50th annual Corfe Mullen Carnival – a record number. These included 208 entrants in the adult race – up 10 per cent on last year – and 125 in the junior section – up a whopping 50 per cent. Wendy Percey from Lesley Shand Funeral Directors, one of the sponsors, handed out trophies to the winners of the various categories. Also handing out trophies was Garry Dickerson from Seyward Window Company, and Cllr Paul Harrison representing Corfe Mullen Parish Council, which sponsored trophies for the first non-club runners over the line. The seniors ran 5K completing two laps of the recreation ground and the juniors ran a single lap of the one mile course. Wendy Percey, whose business is part of the Dorset’s Douch Family Funeral Directors, said: “Being a long-standing Corfe Mullen business it was a privilege to be one of the sponsors of the great carnival and to hand out trophies after the race. “It was wonderful to see so many youngsters taking part – I was exhausted just watching. Carnival Chairman and Race director David Mills said: “Eighteen months ago the committee set about making plans to celebrate the 50th Corfe Mullen Carnival by creating a new, bigger and better event for the community. “Clearly this was a great success with around 5,000 visitors joining in the celebration as CBeebies presenter Chris Jarvis officially opened the Carnival. “I was very pleased to see a significant increase in runners taking part in the Carnival run with trophies presented to the winners and runners-up in each class. 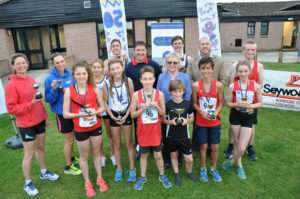 “This year with the support of the Parish Council we were also able to introduce trophies for the first non-club runner over the line who resides in Corfe Mullen. “It was a great event held on a lovely evening and we had some excellent athletes involved across all levels of ability. We hope to have an equally impressive turn-out at next year’s event. In the senior race, Dominic Willmore from Poole Runners was first with teammate John Llewellyn in second place and Michael Johnson of Wimborne AC in third. In the junior race, Wimborne AC had the top three, which were Max Meadwell, Abbie Lovering, and Charlie Davis. All of the entry money received from this years run we be donated to the Carnivals chosen charity for 2016; Julia’s House children’s hospice.